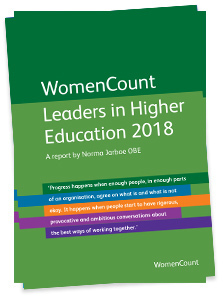 WomenCount is a new, non-profit organisation benchmarking women’s leadership across charitable, academic and public bodies. To date much of the attention on women’s leadership has been focussed on private sector boards and senior women. Other sectors play an equally valuable role in creating a stable, prosperous society and will increasingly be the partners of the private sector in the 21st century. All need to reap the benefits of diverse leadership – more efficient, innovative organisations that respond to stakeholder needs and prudently assess risks. In the belief that “what gets measured gets done”, the company encourages organisations to set aspirational targets for women’s participation, measure the outcomes and report on progress. The expectation is that organisations will achieve a gender balance of leaders – 40%-60% men or women. WomenCount’s research allows organisations and their stakeholders to compare progress being made within their sector. It also provides analysis into what hinders progress and what encourages it. Norma Jarboe OBE is the founder and Director of WomenCount. She was formerly Director of Opportunity Now, the leading employer membership organisation in the UK to advance women in the workplace and has many years of experience in women’s development and diversity. She has worked at senior levels in the private sector, in public/private sector partnerships and in the charitable sector. She currently chairs the Women’ Equality Network Wales and is a former member of the Defra Equality Scrutiny and Advisory Group and a former Chair of its Gender Equality Scrutiny and Advisory Group. Authored reports for Opportunity Now include Tomorrow’s Workplace: Are you fit for the future?, Leadership for Change: Aligning organisations for the future, The Responsible Workplace: How to survive and thrive and Balancing Boards. Norma has an MA in International Studies from the University of Denver and a Diploma from the Stonier Graduate School of Banking at Rutgers University. She was awarded an OBE in 2008 for her work on social inclusion. Amanda Tidman is a research consultant for WomenCount and has been involved with the company since its inception. She has a Bachelor of Arts Degree in History and English Literature from Cardiff University and a Masters in Sexual Dissidence & Cultural Change from Sussex University. She went on to study psychology, achieving a Postgraduate Diploma with distinction from Cardiff University, and now works as a Psychologist and researcher. Her studies and roles within the legal world and in Opportunity Now expanded Amanda’s knowledge of gender issues and this continues to be an area of key concern to her, even playing a large role in her work as a psychologist within a forensic setting.